Two Bears Farm and the Three Cubs: Do You See a Smile Today? Do You See a Smile Today? 1. When the twins took a field trip recently to the pumpkin patch, I spied something smiling at me from the sunflower patch on the hay ride. 2. Pierce recently asked me if he looked like a bishop, as he slid back and forth across the kitchen tile. Of course, I was slightly confused, thinking of the church when he said bishop, but eventually realized he meant the chess piece, as he switched directions and announced he was a rook. 3. I've finished almost all of my Christmas shopping, except for my mom and Paul. 4. I hate the crowds in the stores at Christmas, so for years now I've made it a habit to shop year round. Plus, it helps spread out the expense over the year. 5. I've been seeing a lot of chocolate covered potato chips lately (and even tried some that my sister-in-law brought me). I'm wondering how long it'll be until chocolate covered Cheetos make an appearance? Readers, do you do your shopping early, or do you wait until the last minute, like my husband? I don't think that I will be doing much Christmas shopping this year as the economy looks bad for next year. Well, reading along...came to chocolate covered potato chips....hmmmm, may be good. But then your thought...chocolate covered cheetos?!!!! Ewwwww!!! Love the Bishop story. That's adorable. Oh I love your kids they are full of cool questions "Bishop" very cool. i am jealous that you are done!! next month my husband gets a christmas check for me to shop. his employer has a christmas fund and takes out a percentage each paycheck so you really don't even notice and end up with extra money to shop with! i was thinking the same thing as you about #2! i do the same shopping all year long. i just wrapped some last night. it makes life so much more easier. right??! i think. Pierce is so cute! He says the brightest, funniest things. I'm with you ... I try to do my holiday shopping throughout the year -- then i have to remember where i stashed it all! love the smiling sunflower. i had a sandwich for lunch yesterday --- with potato chips and then a candy bar after -- the potato chip salty and chocolate -- delicious! Wow! ;) have a great week. I would love to do my Christmas shopping all year round. I did that when we were first married and the Husband thought I took the "fun" out of Christmas. I shop for my family and J shops for his family while I push the cart through massive crowds in December. I am not a fan of crowds either. I have made chocolate covered potato chips. I use ruffle chips and almond bark. They are fun to make! I use chocolate bark and accent with white bark to make them pretty. Have a fun weekend, Lisa! I wish I could say that I shop year round but I don't. Then I am mad at myself. And, getting out doing all that heavy shopping is just not my cup of tea at this age.... so most get gift cards from me. Last minute. Definitely last minute! That Pierce is a smart one! Go you-on getting you shopping done! We don't buy enough to fret over shopping--seriously--we donate to charities in our parents' names and just do a pirate swap with D's siblings, so we only have to buy a few boxes of chocolates for post man and paper carrier, gift cards for bus drivers and teachers, and gifts for our boys. Makes the Christmas season MUCH more pleasant. Love that sunflower--and your "bishop!" Last year I did most of my shopping online! I feel bad they push Christmas earlier and earlier, now Black Friday starts on Thursday. Having two girls that work in retail, it annoys me they can't even enjoy Thanksgiving with their families anymore! Pierce must be a smart kid...I love the way a child's mind thinks. I don't get my shopping done early, but neither do I wait till the last minute. Rhaha, the bishop -rook story is hilarious! I do my shopping online starting in November. Everything gets wrapped and reshipped last minute. That's a happy sunflower, so cute. I do most of my Christmas shopping online, I dislike crowds and super malls! Haha, that goofy smile is great! Ha that sunflower made me laugh! 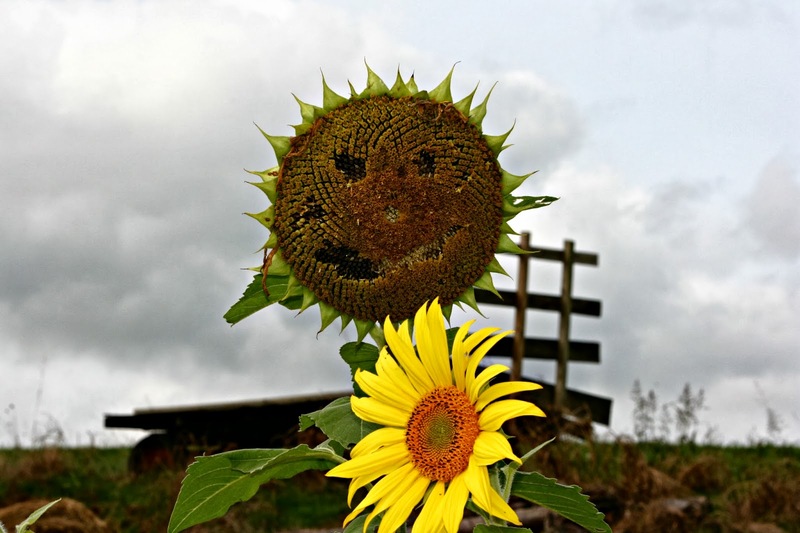 This is so cool, you actually found a smiling sunflower! What a cute story about Pierce, seems like he really likes Chess Club. Goodness, that Pierce is one smart cookie. And I love that sunflower smiling - too cute! I definitely wait til the last minute to do my Christmas shopping. I haven't even given this year's shopping a single thought yet! I shop early and make a lot of my gifts. In fact, I'm late already. I shop year-round. Hubby's a last minute shopper. That sunflower really is smiling at you!! You have quite the budding chess player in the family! Maybe one of these days he will be winning competitions! My son did that for a while in elementary school. I do some throughout the year, but then buckle down to do the rest closer to the end of the year. My husband really enjoys shopping for the larger gifts on the lists that the kids make, and I usually handle the smaller things for the stockings. We often do a gift exchange with a name drawing with my sisters, and so those are planned and purchased way in advance. Lol, I read your Pierce random to Chloe and we both laughed! I can so relate to that. But don't talk to me of Xmas shopping. I'm in Vancouver right now and in place in England for the holidays and with baggage allowances being so restricted I pretty much have to wait till Dec 15th or so to do the shopping. Ugh, I hate it. Thank god for Amazon and Ebay the the brilliant royal mail. Uh, close to last minute and I always regret it. But if I buy things too soon I forget where I put them. I saw a smile there! And chocolate potato chips - ummmm. And I have finished shopping too!!! I like chocolate a lot but have to draw the line somewhere! I cheat and have my d-i-l's buy the gifts for the grandkids. I used to do it when they were babies, but now I don't have a clue. My husband and I don't exchange gifts though we're in the midst of a remodel and that might be our gift for years to come. I like chocolate, but that doesn't sound too tasty. I'm not a last minute shopper, but I could definitely do better than I have been lately. I used to start September 1, then it moved to October, and now I rush through it all in November and first part of December. My grands are really hard to buy for. Haven't seen choc covered chips and best that I don't. Now, if they do come out with the cheeto's; my daughter will be first in line. I have been busy making my presents this year.. I have a easy easy knitted slipper pattern and I'm making wool slippers for my family.. I'll slip a $20 bill into each slipper and that well be my present for my family this year.. My friends are going to get home made lip balm with a piece of chocolate candy.. Teachers love my lip balm and it's something they can use year round.. Thank you for the smiles today. Blogville has had some sad days- and so we are all trying to make it througH. You are pretty observant to notice the smile on that sunflower. The birds pecked that just for you. by last minute - do you mean a couple of weeks before? That's me!! LOVE that SMILE on the Sunflower!!! Hope you had a good week. We have been in Kentucky with friends... Had a fantastic time although it was COLD there. I haven't started my Christmas shopping yet. I wait until people tell me what they want! Usually I have to remind them, which I'll probably start doing once November is here. We don't do Christmas anymore since the kids are gone. We send them money for one "big" Christmas present each. This year, my son is spending his on a PS-4, and my daughter is buying a saddle. When the kids were young, I'd be done and wrapped by Thanksgiving so that we could just enjoy the holidays without stressing out. Now, I don't have as many people to buy for and the kids just want spending money, so I don't shop as early as I used to. I hate the stores though---too hot and crowded. Chocolate potato chips....hmmm, interesting! I'd probably be willing to try some!